This week an experimental Air Powered Car, another amazing creation from Barry Bosman (barebos, barman or Barman76). The idea is brilliant, the execution perfect, and the result seems much funny to play with. With such light structure and two powerful fans the car runs quite fast, and the two fans also offer an excellent means to maneuver or steer the vehicle. Definitely a model that should offer a great playability. In the first part of this video the car uses steady back wheels and as you can see, it seems quite easy to steer. On the second part it uses 3 casters and from Barry's comment, I guess the control is gone... However we can't see it, because flickr cuts any video uploaded, after second 90. Better to use YT instead. This is absolutely great! A very good idea, shownin a quite simple build! Those are some of the best MOCs! Conchas: wouldn't the fan in the diorama be quite noisy? A bit... not exactly the "fan", but more like the motor and gears. I thought these motors required 1 battery box each (this may only be the case when they have a bigger load). For those who don't have an RC motor, you can create a motor with similar speed (but higher efficiency), by effectively removing the second stage of planetary gearing in a PF XL motor. I did this by cutting some of the teeth off the three planet gears so that they no longer touch the ring gear, and then gluing the three planet gears back onto the orange base. Not only the blades, but also the motor. The E-Motor has higher speed and lower torque, which in an application like this is ideal. 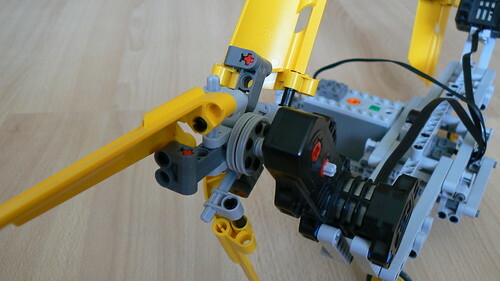 And I agree with 222doc on the reverse pitch blades, for the same reason... but still doubt flight is achievable with LEGO only parts, even using optimised blades, fast motor and lightweight Li-Ion battery. Conchas e-mailed me the direct hyperlink to the Flickr video: http://www.flickr.com/photos/50191917@N06/4860201817/in/photostream/ . I used that to see the entire video. Although some reversible blades would be nice, note that added complexity leads to added weight, and possible loss of mobility in this light vehicle. Yes the idea would be that opposite turning props will cancle out the "torque steer" issue if it was an attemtp to get lift. THe whole idea of a lego flying objects LFO is an enigma for sure. One of those "it can't be done" things that I would love to see done. The bad is the blades come in a kit that is very expensive as well. THe E motor is too weak, The bldes would not be fast enough, I wonder if those blades may even be to moch for the Buggy motor to turn very long? They can get hot too. But a pair with a very light Lipo may very well get lift, how to control it? No matter if you get it to Lift and even crash right after it still the first to Fly. I am in the camp of it might be possible..
Hello, I have a better idea for Propeller :). @everyone, thanks for al you comments and great reactions. Be sure to check out my video of the race tank based on the Ripsaw from the Howe brothers. Can you explain what do you mean with "lock/unlock" casters, at your new video? So you can manually set the casters, to be lock or unlocked. Did TLG listened us finally? Is it my 8043 wearing into dust? Week TechVideo, 2010 #36 - Quad-ped X-4 "Sloth"
A new large sized car. Can it be?